Later, after Westbrook’s teammate Paul George attempted (unsuccessfully) to dunk on Embiid, he admitted it was in revenge, and as the game ended, Westbrook dribbled out the clock while staring directly at Embiid. Afterward, Embiid called the play a “crime scene investigation” on Instagram, and Westbrook intimated that the feud between the players would continue at the All-Star Game. And the NBA world rejoiced, because, yes, we had a new NBA beef. The NBA is now a league run by beefs, and it is glorious. As the NBA season concludes and enters another thrilling set of playoffs, it must be asked again: What have we ever done to deserve a league this entertaining? of the players, which culminated in the immortal moment when LeBron James called the president “U bum” on Twitter (and generated such a wave of NBA love and goodwill Colin Kaepernick must’ve thought he was watching the proceedings of a bizarro alternate universe). But one of the most consistent reasons the NBA is so compulsively compelling is that — I’ll just say it — its players are constantly fighting with each other. Of course, these aren’t fight-fights, most of the time — they’re not fighting with each other the way Ron Artest fought with Indiana Pacers fans, or Kermit Washington fought with Rudy Tomjanovich. They’re fighting with each other the way everybody fights these days: through media, social or otherwise. Embiid is the king of this — the Westbrook beef was the continuation of a battle from earlier this season that had ended with Embiid mocking Westbrook’s infamous ball-hogging by saying, “The dude shot like 10 for 33. I wish I would have shot 33 times,” after a loss to Oklahoma City in December. But being able to roast your opponents has become as vital a feature of the NBA as the pick-and-roll or the headband. Everybody’s doing it. Rajon Rando (then with Chicago) called out his entire team on Instagram for not caring enough about winning. Portland’s C. J. McCollum told Chandler Parsons (now with Memphis) his team “hit the lottery by not signing you” on Twitter. The Knicks’ Enes Kanter told Phoenix’s Jared Dudley that he needed to “get on the treadmill before you talk, bro. You got the retirement body.” It even can get political, with former NBA star Kenyon Martin going after Jeremy Lin for wearing braids, which led Lin to write a piece in the Players’ Tribune that contained the phrase “Bro, what about appropriation?,” which I can comfortably say I’ve never heard a professional athlete say in my years of covering sports. (This feels like progress, I think? Either way, it’s hilarious.) The battles have become so heated that some players have found it necessary to create burner accounts impersonating fans to defend themselves online, leading to the deeply embarrassing moment when Kevin Durant, fresh off his first NBA championship, apparently responded to a fan’s trash-talking with his own, real account instead of switching over, as he had presumably intended, to what was later revealed to be an account Durant apparently set up under a fake name to support the real KD. Embiid later roasted Durant for this, of course. Even LeBron James has gotten into the action: Essentially the old man of the NBA, though he’s only 33, he’s been playing (and managing his image very carefully, for the most part) for 15 seasons, which means that Knicks point guard Frank Ntilikina was 4 years old when LeBron entered the league. Lately, LeBron’s own social-media accounts have become a sometimes hard-to-parse window into his and his team’s personal dramas — whether he’ll re-sign with Cleveland next season, whether he’s fighting with teammate Kevin Love, whether he might want to play in L.A. someday. That LeBron posted a picture of children’s cartoon character Arthur on Instagram, I swear to you, legitimately rocked the NBA for a good three days in November. (The meme is shorthand for anger, and he posted it right after a big performance from his former teammate Kyrie Irving.) Which may be longer than the league shook after the Cavs traded away almost his entire team at the deadline. It’s a wild time. This is the natural result of a league that has boldly encouraged its players to express themselves however they see fit and then marketed them on the basis of their emotions; in that universe, their beefs become our beefs. That LeBron James and Kevin Durant might dislike each other is a signature NBA story line, as much as “Can the Yankees beat the Red Sox?” is for MLB. It isn’t “off-court” business; it is the business. Not to say it’s all trivial; it affects the play as well. This year, to liven up the All-Star Game, the NBA decided to have the top-two fan-vote-getters (LeBron and Curry) be captains of the opposing teams and then draft the remaining All-Stars, like kids on a playground. (That the draft event wasn’t televised elicited much derision, but it surely will be next season; it would basically be NBA Bachelor and thus unmissable.) When the rosters of each team were released, Westbrook was listed last, and the point guard, made furious by the dis, went out and scored 46 points in a win that night. It wasn’t until afterward that someone informed him the names were listed alphabetically. Needless to say, this is irresistible to watch. For all the talk of simply enjoying athletic prowess, sports fans love drama as much as anybody. In fact, it’s even more satisfying in sports because the bickerings get a definitive resolution: Eventually, the two people involved in the feud must face off against each other. (Imagine if every Real Housewives episode ended in a joust.) Sports has often been called “soap operas for men,” a way for them to smuggle the pleasures of overheated drama past their self-regulating impulses, but that explanation seems limited; after all, there are millions of female NBA fans who love it just as much. And fans have always loved this stuff, from Billy Martin vs. George Steinbrenner to Shaq vs. Kobe to Muhammad Ali vs. the World. But the NBA has elevated the beef to an art form. It’s like when it first broke the insane taboo on dunking — and made the whole world wonder why anyone would ever keep that weapon in the holster. It has also been a sort of necessary innovation, considering that the outcome of the NBA season hasn’t been this obvious since at least the days of Michael Jordan’s Bulls. 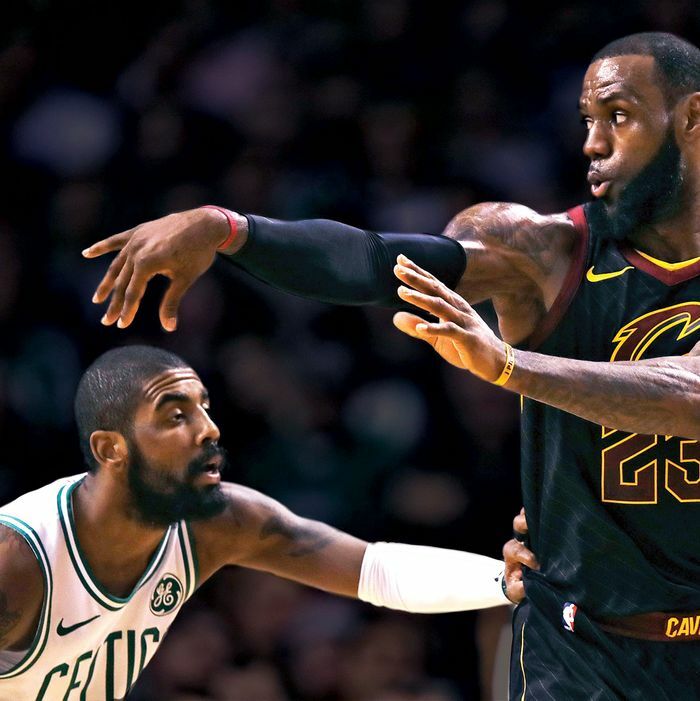 For all the excitement provided by the Houston Rockets, Toronto Raptors, and Boston Celtics, teams that have shaped themselves into legitimate title contenders, the betting odds remain that the NBA Finals will be Warriors-Cavs for the fourth consecutive year. This is a league in which at least 80 percent of the teams head into the season knowing they have no chance of winning the championship. For all the heated battles between Embiid and Westbrook — and for all their otherworldly talent — neither Philly nor OKC has a legitimate route to the title in 2018. Their feud is ultimately pointless in the grand scheme. But so what? The fun of sports is in the moment; right now, in this moment, those two dudes are beefing.